I had a perfect time, Majesty had cleared half the coarse perfectly without a single flaw. The last jump was 4:2, I hadn't brought Majesty over jumps that high much, But his previous owner was a big time horse person so he could get it done. We came to the straight away towards the jump, one..two..three..four..five, I got, perfectly on beat. Majesty's legs cleared the jump with out effort, My heart pounded with excitement. I finished with a victory circle in front of the Judges, and slowed Majesty to a collected trot. the crowd burst out with cheers. I gave Majesty a pat on the neck, and whispered into his ear "A score like that deserves 2 pepper mints, maybe even 3". His ears pricked up, as if looking forward to munching on the treats. YOU ARE SOOOOOOOOOOO LUCKY! 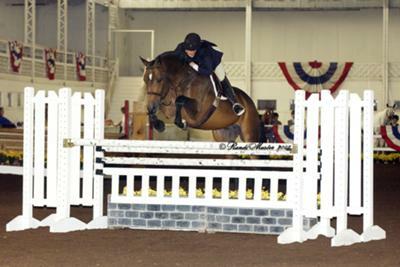 WHEN I JUMP WITH MY HORSE IT SEEMS I ALWAYS LOSE MY STIRRUPS. I'm trying to get a hunter horse that nice myself, your very lucky. Thats really cool i love it!!!!!!!!!!! !